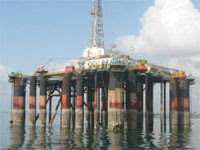 The rig is presently hot stacked in Africa and is for immediate sale, the superstructure is in good order and is designed to operate sitting on sea bed or floating. The rig will require the usual cosmetic refurbishment but on the whole is in good condition and can used for drilling , production or accommodation. Hello, I'm a serious buyer for your rig, please contact me in person. pls.contact me.We are looking for more rigs if you have. Hi there, our company are interested in buying. Let me know of your asking price.